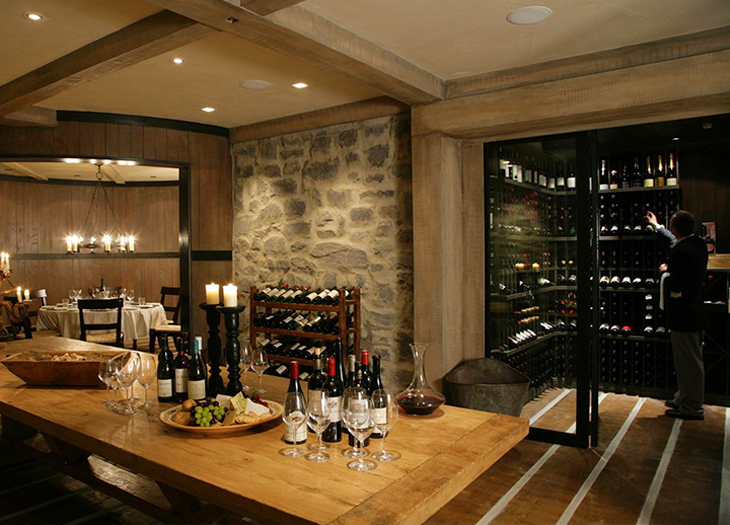 Sip some of the area’s finest in The Wine Room Lodge at The Farm at Cape Kidnappers. A little winetasting and a few late nights are in order on this 15-day itinerary. Hop a flight from the Eagle’s Nest Sacred Space Villa’s helipad. Enjoy private dining Huka Lodge-style, beside the Waikato. A little winetasting, maybe a limit-testing hike, and a few late nights are in order on this grown-up 15-day itinerary from an Auckland-based Virtuoso on-site. You are free to tailor it to your wishes with added days and activities. And because some top New Zealand lodges don’t allow young children, if you prefer your cocktail hour sans the LEGO set, this is the trip for you. On flights from Los Angeles to Auckland, Air New Zealand offers 777-300 Business Premier Class seats (22-inch-wide, white leather, lie-flat beds-in-waiting) and its LAX lounge has six shower suites for preflight freshening up. Air Tahiti Nui also offers direct service from Los Angeles to Auckland. Arrive in Auckland. A Southern Crossings envoy will meet your flight to hand over your trip dossier. 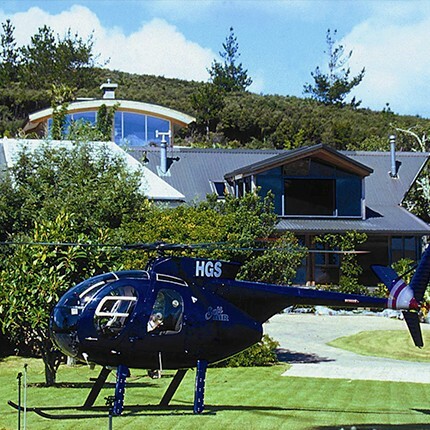 Your mission: Transfer to the domestic terminal and hightail it to the Kerikeri Airport in the Bay of Islands. First stop: Russell’s Eagles Nest, a collection of five distinct—and distinctly over-the-top (fully-stocked kitchens, private pools, and Jacuzzis)—private villas on a promontory above blue-green water dotted with verdant gumdrop islands. Cruise the bay on a privately chartered boat for dolphin-spotting, snorkeling, and swimming, then throw in an extra activity or two, such as golfing at nearby Kauri Cliffs, game fishing, or a helicopter flight to the country’s northernmost tip, Cape Reinga. Fly south to Taupo and collect a rental car for two nights at Huka Lodge on the banks of the Waikato River. There’s a reason the queen of England likes it here: impeccable but unstuffy service, rolling lawns, gracious cottages, and plenty of private nooks for dining or just curling up with a magazine. Excursions aren’t planned for you here, but if you decide to abandon your riverside chaise longue, you might dip a line at one of the area’s acclaimed trout-fishing spots, visit Rotorua’s bubbling geothermal pockets, or soak in Taupo’s hot springs. Drive about three hours south of Taupo to Hawke’s Bay, which produces some of the country’s great wines—and great golf games. Sample both during two nights at The Farm at Cape Kidnappers, Julian Robertson’s working sheep farm/luxury lodge/par 71 golf course/gannet colony with 180-degree vistas of the ocean. Spend one day on a guided biking tour of the region, with stops in small towns and for winetasting—including one at the country’s oldest winery, Mission Estate. Fly from Napier to Christchurch on the South Island for a little downtime (or not, if you’re not the downtime type—add a hot-air balloon flight over Canterbury’s countryside) at Otahuna Lodge. Once the country’s largest private home, the 1895 Victorian (a 20-minute drive south of Christchurch) is now a seven-suite lodge. Fly to Queenstown, where adrenaline-fueled fantasies come true (bungee jumping, skydiving, winter skiing, hiking, and more), then drive to Blanket Bay, a no-kids-under-10 ode to solitude on 60,000 acres in Glenorchy at the northern reaches of Lake Wakatipu. On day 13, a helicopter scoops you up at Blanket Bay for sightseeing over the Southern Alps and Milford Sound. Touch down on a glacier for one of the trip’s most post-worthy photo ops. Want to Take the Kids?